The start of the 2012 NFL off-season has just commenced, so hence there shouldn’t be any fright on what the future holds for the Miami Dolphins, right? Ryan Tannehill quarterback of the future? Precisely. This off-season has felt long due to the dubious transactions the Miami Dolphins have established including trading MVP Pro Bowl wide-receiver Brandon Marshall and losing out on multiple free agent quarterbacks and wide receivers (names like Peyton Manning, Matt Flynn, and Vincent Jackson). Lo and behold there is the 2012 NFL draft as the savior to the Miami Dolphins’ complications. There is no doubt that the Miami Dolphins have to find one, their quarterback, which hasn’t been established since the great Dan Marino and two, the number one go-to wide receiver. In this past season, fifth-year quarterback Matt Moore had flashes off brilliance game after game, on a consistent basis. Which leads many people inquiring for what actions will be taken place on April 26, 2012. All ears and eyes will be intuitive on the Dolphins management. At pick number eight, the Dolphins can address many options. As for as the defense goes, there aren’t many priorities on that side of the ball but for offensive there are gaps to fill in the quarterback, wide receiver, and possibly the tight-end position. 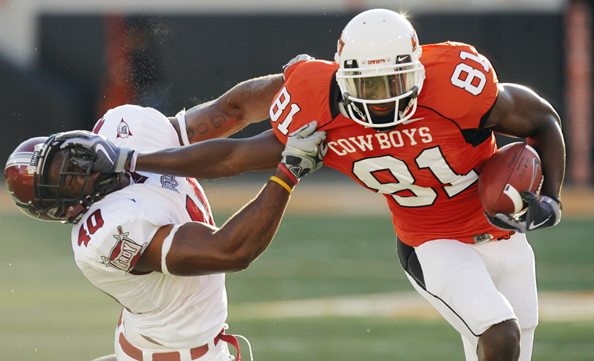 Justin Blackmon can be a number one wide receiver. In evaluating all of their options and assuming top prospects Andrew Luck and Robert Griffin III are gone, I see guys like former Texas A&M quarterback Ryan Tannehill, Oklahoma State wide receiver Justin Blackmon, and Oklahoma State quarterback Brandon Weeden on the horizon for the Dolphins. Tannehill is a player to keep an eye on. He could be captured the Cleveland Browns at pick number four and maybe as early by the St. Louis Rams at pick number six if they ultimately decide to trade quarterback Sam Bradford. The perfect fit for the Aggies’ quarterback is Miami due to the offensive coordinator Mike Sherman. Sherman was Tannehill’s head coach at Texas A&M. Coach Sherman was the head coach from 2008-2011. They have a very close relationship. 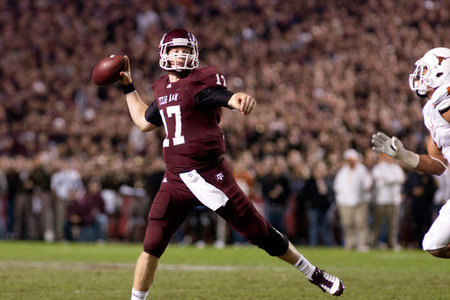 Tannehill capped off his senior year with 3,744 yards, 29 touchdowns, and 15 interceptions. Blackmon is one of, if not, the best athletes in all of this draft. The former Cowboys’ wide receiver was not a force to be wrecking with. Since Miami doesn’t have a go-to guy, they could possibly make a splash in picking this phenomenal player off the board. He has made a substantial impact in his senior year tallying for 121 receptions for 1,522 yards, and 18 touchdowns. The passer on the end of those completions was quarterback Brandon Weeden. This player has a story like no other.Weeden was in MLB, in the U.S. Army, and previously the starting quarterback for OSU at age 29. He recorded 9,260 yards, 75 touchdowns, and 27 interceptions at his time with the Cowboys. Ultimately the decision do you go with the picture perfect piece in Tannehill, the best wide receiver Blackmon, or the old veteran quarterback Weeden. We will all find out what GM Jeff Ireland and Owner Stephen Ross has in stored.